North Korea’s dismantling of its major nuclear test site will likely go ahead as planned this week, but it was unclear as of Monday evening whether South Korean reporters would be able to cover the event. North Korea declined to accept a list of South Korean journalists assigned to cover the dismantling of the Punggyeri nuclear site, which the North said will happen sometime from Wednesday to Friday, the Unification Ministry said in a regular briefing on Monday. The Unification Ministry attempted to notify North Korea of the names of the reporters through a hotline at the truce village of Panmunjeom, but the North did not respond, according to the ministry. The hotline was closed at 4 p.m., with plans to resume its operation on Tuesday. “We hope that the event to dismantle the Punggye-ri nuclear site goes as planned without a problem,” the ministry spokesperson Baik Tae-hyun told reporters at the briefing. 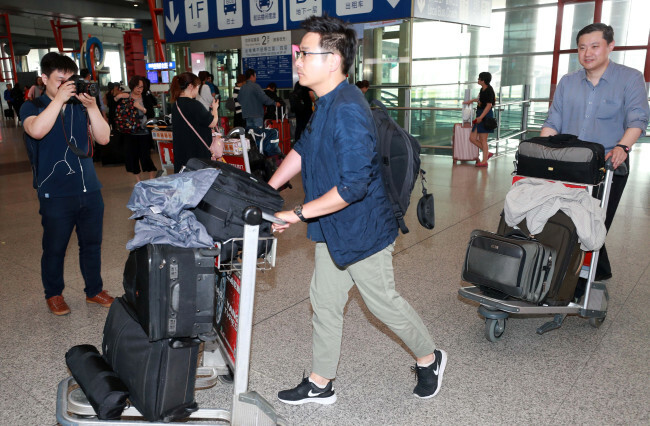 Despite uncertainties, reporters from a privately-run news agency News1 and public broadcaster MBC arrived in Beijing on Monday waiting to get a permission to enter North Korea. Pyongyang said earlier this month that it would dismantle the nuclear test site in the country’s mountainous northeastern region and invite foreign journalists and experts for them to witness the tunnels being collapsed, apparently in an attempt to show its sincerity about denuclearization. It officially invited a limited number of journalists from five countries – South Korea, the US, China, Russia and the UK. But it is unclear whether the North invited any experts, raising questions over whether the process could properly be assessed. Reporters from foreign news media outlets covering the event were reportedly instructed to gather at the North Korean Embassy in Beijing on Tuesday morning and take a chartered plane to North Korea’s Wonsan Kalma Airport. They were reportedly asked to pay $10,000 per person for the visa. From Wonsan, where a press center will be set up, they will travel to the Punggye-ri site by rail, according to news reports. There are signs of North Korea preparing to host journalists for the dismantling of the nuclear site. 38 North, a US website monitoring developments in the North, reported that satellite imagery showed the North preparing to build a viewing stand for the visitors near the test site. The North’s move comes after it abruptly canceled high-level talks with the South on Wednesday, denouncing the ongoing joint South Korea-US air combat drills. It also threatened to call off a summit with US President Donald Trump, scheduled for June 12 in Singapore. The North’s shift in tone from monthslong conciliatory gestures has been largely viewed as a tactic to increase its leverage ahead of the high-stakes meeting with the US, as well as an indication of its discomfort about a denuclearization method demanded by Washington.